Home Expert Advice Skincare Advice Acne & Breakouts Bye, Bye Blackheads! We understand the frustration of dealing with stubborn blackheads—no amount of scrubbing gets rid of them (if anything that often makes it worse). Once you understand the cause, the path to getting rid of blackheads becomes much clearer. We’ll use our research-backed information to reveal how to do just that. When too much oil is produced inside the pore, it has difficultly flowing freely to the surface. As the flow of oil gets backed up, it mixes with the built-up dead skin that isn’t shedding (exfoliating) as efficiently as it should. Once this occurs and the oil and dead skin at the top of the clogged pore is exposed to air, it oxidizes, forming a blackhead. Reestablish, as best as possible, a normal flow of oil out of the pore lining. Minimize and absorb excess oil. Exfoliate built-up dead skin that isn’t shedding normally. Unfortunately, lots of products that promise to get rid of blackheads aren't capable of doing any of the above. In fact, they often contain ingredients that actually make matters worse! Before we can show you the most effective ways to diminish blackheads, we need to point out which products and ingredients should go on the blackhead blacklist because what not to use is as important as what you should use. Shockingly, lots of products claimed to address blackheads contain skin-aggravating ingredients such as alcohol, peppermint, menthol, lemon, lime, eucalyptus—all of which actually trigger more oil and make matters worse! You can't scrub blackheads away. Blackheads are too deep in the pore to be removed by surface scrubbing, and the abrasiveness only upsets skin even more. 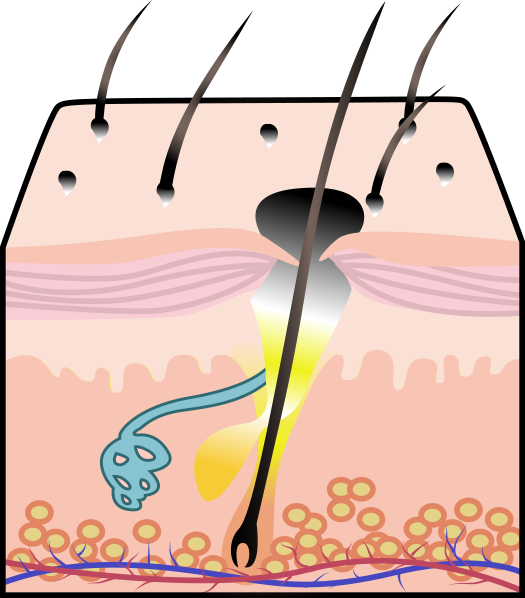 Blackheads cannot be pulled out of the pore by using pore strips. Pore strips remove only the very surface part of a blackhead, which has no effect on the pore quickly getting clogged again so you'll see it back way too fast. Bar soap is a problem for fighting blackheads because the very ingredients that keep bar cleansers in their solid form can clog your pores. Use a gentle, water-soluble cleanser and a soft washcloth or soft bristled cleansing brush for a bit of extra cleansing to be sure you get all your makeup off and the surface of skin is clean, but don't overdo it. Cleansers or scrubs that make skin feel squeaky clean, tight or dry, may seem like their getting rid of the oil but as those of us with oily skin know too well, it’s back again with a vengeance. The over-cleansing didn’t change a thing and actually just compounded your skin’s problems. Avoid overly emollient or greasy moisturizers in blackhead-prone areas. As much as possible, use only gel, light fluid lotion, or liquid skin-care products because most of the ingredients that give lotions and creams their thick consistency can clog pores. Use a well-formulated, completely non-abrasive, leave-on salicylic acid exfoliant (also called BHA). Unfortunately, there are very few products available that meet our standards for this skin saving step. We recommend our CLEAR Extra Strength Anti-Redness Exfoliating Solution with 2% Salicylic Acid, which can help shed built up dead skin that would normally mix with oil in the pore and risk turning into a blackhead. This exfoliant is also incredibly effective in smoothing out those stubborn, tiny, hard, white bumps that occur primarily on your cheek bones but can show up in other areas too. Suitable even for those with milia-prone skin. Absorb excess oil. Those with oily skin and congested pores can benefit from our SHINE STOPPER Instant Matte Finish with Microsponge Technology or a non-irritating, absorbent clay mask like our SKIN BALANCING Oil-Absorbing Mask. It’s one more way to improve your odds against blackheads! Can I Remove Blackheads Myself? If stubborn blackheads won’t go away, consider extraction from a well-trained aesthetician. An aesthetician who knows what they are doing can extract blackheads without hurting your skin. You can also try it yourself with our Professional Blemish Extracting Tool but follow our instructions carefully. Aggressive squeezing, poking, and prodding can aggravate skin and cause a bigger problem than what you started with.